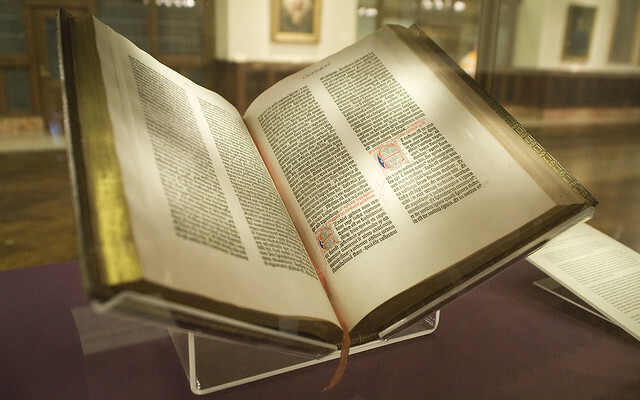 Shown above is the Lenox copy of the Gutenberg Bible from the Rare Books Division of the New York Public Library. Image: Gutenberg Bible by NYC Wanderer via Flickr.com. CC Attribution. The Gutenberg Bible, Latin Vulgate Ca. 1455, is the first substantial book in history to be printed with movable type. It remains today as one of the world’s greatest historical treasures marking the beginning of the printing revolution. Its printing was first completed in 1454 or 1455 by Johannes Gutenberg at his print shop in Mainz, Germany. It is only fitting that the first book printed with movable type, a major transformational event in history, should be the Bible — the most historically accurate and reliable book in the World. A book demonstrating that historical accuracy is presented below. Included below are the following excepts from the book: The Historical Accuracy of Biblical Chronology. I encourage you to read this entire book. This book presents solid evidence, some of which you may not have encountered before, from science, archaeology, history and the Bible, concerning evidence in support of the Biblical time frames for the Creation, the Genesis Flood, and the beginnings of human civilization in ancient Egypt and Mesopotamia. There have been some recent updates to this book, so you will want to make sure you have the latest version. Many attacks in recent years have been leveled at the Scriptures by modernistic critics of God’s Word in the area of the chronological accuracy of the Bible. These attacks deal especially with the Egyptian and Mesopotamian chronological systems and their resulting discrepancies with the Biblical record. Because the chronology of Egypt is not definite and can be stretched to fit their preconceptions, most critics have used it as a base of attack against the Word of God. Usually the beginnings of recorded Egyptian history are placed 500-600 years earlier than the Bible indicates they should have been. The First Dynasty of Egypt (beginning with Menes) is usually placed by most historians at about 3000 B.C. Yet, according to the Biblical record it could not have been earlier than about 2500 B.C. (the time of the flood), since all previous archaeological records would have been destroyed prior to this time in the flood. Actually, there was probably a gap of 100-200 years between the flood and the beginnings of recorded Egyptian history. In contrast, the Assyrian records place the beginnings of history in Mesopotamia at about 2400 B.C. which squares well with the Biblical record. Most Assyriologsts accept this approximate time period for the beginnings of recorded history in that area. Since the Bible indicates that history begins in the Mesopotamian valley (see Nimrod, Gen. 10), Egyptian history must have begun just shortly after Mesopotamia (about 2300 B.C. ), and not vice versa. With this in view, it will be the primary purpose of this book to demonstrate the accuracy of the Biblical account. I will endeavor to show that, where the Bible and history are in conflict, the Bible is by far the more reliable source. A second purpose of this book will be to explain that the scientific clues which we have today better support the young earth of the Biblical record than they do an earth of some 4.5 billion or more years in age. A third purpose will be to establish, within these pages, that man has emerged upon the annals of history in relatively recent times. According to the Bible account man is a little under 6,000 years in age rather than the million or more years proposed by the evolutionist. A fourth purpose will be to establish that modern archaeology, no matter how sophisticated, can only transport us back in time to somewhere around the year 2500 B.C. The Flood had to destroy, by its very nature and magnitude, all archaeological evidence before that awesome event. From the time of Moses until today the Bible has stood the test of time. Many people of all walks of life have arisen from time to time with their hammers of skeptical argument to smash the Word of God. Each of these skeptics in turn has either been converted to the truth they once denied or died in unbelief. The Bible lives on from generation to generation as a secure ship upon the turbulent sea of history. Those who are wise enough to obtain passage upon this ship of hope are brought safely to the Haven of Rest at life’s end. Those outside this ship perish in the frigid waters of skepticism and unbelief. Like the anvil that wears out the many hammers that beat upon it, so the Word of God has withstood, from Moses until today, every hammer that has attempted to break its foundation in the history of man. It is often a difficulty in the back of the minds of some individuals that the early chronologies for Egypt and Mesopotamia do not seem to line up with the Biblical reckoning. To confuse the issue, historians often present chronological schemes as if they were established fact without any degree of uncertainty associated with them whatsoever. This is simply not the case. When all the facts are out, it is clear that there exists much uncertainty regarding the early chronologies of many ancient empires. In contrast to these uncertainties the Bible, although not a chronological sourcebook, presents some definite chronological information which can beneficially help the historian and archaeologist fill in their uncertain chronologies more completely. In fact, I feel that if the historian would do this, the evidence he does have would fit together much more easily than they do using his current methods. On the basis of the information presented so far, it can be clearly seen that where the Bible and history are in conflict, the Bible is by far the more reliable source. Where a conflict does exist it only proves history wrong and not the Bible. God’s Word is true. His Word is an anchor to the soul. His Word is life-giving. Men would do well to take more earnest heed to what is contained within the pages of the Bible. To those who have openly and honestly done so the result has been the salvation of their souls. Another major difficulty in reconciling the Biblical Chronology with the generally accepted geologic timetable has been the often bitter controversy over the age of the earth. Embedded deeply within this controversy lurks an even more fundamental issue of the conflict between two opposing camps of vastly differing viewpoints and philosophies. These two differing viewpoints are creationism and evolution. The two differing philosophies are fundamental Christianity and secular humanism. Since the scientific study of clues which yield insight into past events always, by its very nature, begins with philosophic assumptions as beginning premises, the nature of the philosophy underlying these assumptions will greatly color and influence the conclusions drawn. The effect of the philosophy underlying a scientific investigation is an issue seldom considered by scientific laymen. Since secular humanism denies God and the supernatural and embraces evolutionary concepts concerning the origins and future of man, the natural impact of this philosophy on scientific study would be to down play the supernatural and cataclysmic explanations of geologic and biologic observation, and to trumpet the case in favor of uniformitarianism, evolution and vastly extended timetables. The effect of this philosophy upon scientific endeavor is obvious. Fundamental Christianity, on the other hand, believes in God, believes that he created the heavens, the earth, all life and man in relatively recent geologic time. This fundamental philosophy of life also encompasses the belief that God has in times past and does today intervene supernaturally in the past events of historic geology and in the present affairs of men. Two notable examples of supernatural intervention by God, of course, are one, the creation and two, the Biblical Flood of Genesis. This fundamental philosophy, when applied to scientific study, has an obvious influence upon the conclusions drawn especially concerning past geologic and human history. When the allegation is raised that science and the Bible are in conflict the issues involved are seldom scientific, but rather supposed evidences subject to interpretation. It is my firm belief, after much study and thought, that the Biblical account of creation, the flood, the history of man, and historical chronology is by far the most accurate record of these events the world possesses. This conclusion has been proven over and over again in the archaeological digs of the last century. In addition, new evidence in the field of molecular biology is increasingly leaving the evolutionist without a sanctuary into which to retreat from the miraculous intricacies and mysteries of molecular life. If this were not enough, new scientific evidence is surfacing which supports a very young geologic earth. The young earth evidence, if adopted, would shatter any hopes of the evolutionary theory to continue to survive. The only logical alternative is creation. When science or archaeology are in conflict with the Bible, it does not prove that the Bible is in error. On the contrary, when science or archaeology contradict the Bible it proves only one thing. And that one thing is that those areas of science or archaeology which conflict with the Biblical record are in error. The Bible represents the most reliable and accurate witness we have to the past history of man and the earth. The archaeologist and scientist would greatly advance their respective disciplines if they took more earnest heed to the pages of Scripture. Most, if not all, scientific clues to the past history of man and the mysteries of life in the present are more easily explained from a Biblical viewpoint than from an evolutionary one. One example of this comes to us from historical geology. The geologic structures of the earth are more easily explained by the universal Flood of Genesis than they are by uniformitarian, naturalistic geology. There are major problems with uniformitarian interpretations of geology. These problems do not exist with flood geology. A very good book on the flood and its scientific implications is The Genesis Flood co-authored by John C. Witcomb, Jr. and Henry M. Morris. I highly recommend this book to anyone with questions in their minds about this subject. In conclusion, it is seen again that as the proverbial anvil wears out the hammers that beat upon it, so the Word of God has stood the test of time. However, the most accurate chronicle the world has ever known, and the most widely published book of all time, is by many one of the least read volumes in their library. Yet, the Bible sits upon that old library shelf as a faithful witness awaiting the day when the treasures of wisdom and knowledge contained within its pages might be imparted to a new discoverer of timeless truth. The Bible is the Word of God. This table provides an overview of the contents of The Historical Accuracy Of Biblical Chronology. Biological Life Forms: Evolved or Created? This Bibliography is a good place to find resource materials for you own investigations into Biblical Chronology. 1. William F. Albright, Recent Discoveries in Bible Lands, pp. 5-7, (1936). 2. Charles F. Pfeiffer, “Archaeologists and Their Work”, The Biblical World, pp. 67-84, (1946). 3. Giovanni Pettinato, “The Royal Archives of Tell Mardikh-Ebla”, The Biblical Archaeologist, 39:44-52, (May 1976). 4. Sir Gavin de Beer, “Darwin, Charles”, Encyclopaedia Britannica, 15th ed., Macropaedia, Vol. 5, pp. 492-496, (1975). 5. Stuart E. Nerins, “A Scriptural Groundwork for Historical Geology”, Symposium on Creation, Vol II, p. 78, (1970). 6. W.F. Libby, “Accuracy of Radiocarbon Dates”, Science, Vol. 140, pp. 278-280, (April 19, 1986). 7. Millar Burrows, What Mean These Stones?, p. 291, (1956). 8. William F. Albright, The Archaeology of Palestine, p. 127-128, (1960). 1. William M. Davis, “The Value of Outrageous Hypothesis”, Science, Vol. 63, pp. 465-466, (1926). 2. Patrick M. Hurley, How Old is the Earth?, p. 12, (1959). 3. Robert V. Gentry, “Cosmology and Earth’s Invisible Realm”, Medical Opinion and Review, Vol. 3., No. 10, pp. 64-79, (October 1967). 4. Melvin A. Cook, Pre History and Earth Models, pp. xiv, 1-2, 14, (1966). 5. Donald E. Chittick, “Dating the Earth and Fossils”, A Symposium on Creation, Vol. II, pp. 69-70, (1970). 1. James F. Coppedge, Evolution: Possible or Impossible, pp. 73-75, 93, 137-138, 160, (1973). 2. A.I. Oparin, Life, Its Nature 0rigin and Development, pp. 59-60, (1961). 3. John C. Kendrew, The Thread of Life, p. 63, (1966). 4. Gary E. Parker, “Origin of Life on Earth”, Bible-Science Newsletter, Vol. VIII, No. 12, p. 4, (December 15, 1970). 1. E.S. Edwards, “Absolute Dating from Egyptian Records and Comparison with Carbon-14 Dating”, Philosophical Transactions of the Roya1 Society of London, Series A, 269:11-18, (1970). 2. Wolfgang Helck, “Chronology” (in part), Encyclopaedia Britannica, 15th ed., Macropaedia, Vol. 4, pp. 575-576, (1975). 3. Ronald D. Long, “The Bible, Radio-Carbon Dating and Ancient Egypt”, Creation Research Science Quarterly, 10:19-30, (June 1973). 4. Richard A. Parker, The Calendars of Ancient Egypt, (1950). 1. A. Sachs, “Absolute Dating from Mesopotamian Records”, Philosophical Transactions of the Royal Society of London, series A, 269:19-22, (1970). 2. M.B. Rowton, “Chronology” (in part), Encyclopaedia Britannica, 15th ed., Macropaedia, Vol. 4, pp. 575-576, (1975). 3. M.B. Rowton, The Cambridge Ancient History, 3rd ed., Vol. 1, pp. 193-237, (1970). 4. Jakob Houtgast, “Eclipse, Occulation and Transit”, Encyclopaedia Britannica, 15th ed., Macropaedia, Vol. 6, pp. 188-196, (1975). 5. W.F. Albright, Bulletin of the American Schools of Oriental Research, 88:28-36, (Dec. 1942). 6. W.F. Albright, American Journal of Archaeology, 47:492, (1943). 7. A. Phoebel, Journal of Near Eastern Studies, pp. 247-306, 460-492, (1942); pp. 56-90, (1943). 1. Merril F. Unger, Archaeology and the Old Testament, (1954). 2. Edwin R. Thiele, The-Mysterious Numbers of the Hebrew. Kings, pp. 44if, 54if, (1951). 3. Edwin R. Thiele, Journal of Near Eastern Studies, 3:147, 184, (1944). 4. John C. Whitcomb Jr. and Henry M Morris, The Genesis Flood, (1961). 5. Violet M. Cummings, Noah’s Ark: Fact or Fable?, (1972). 1. Jack Finegan, Light from the Ancient Past, (1959). 2. Charles F. Pfeiffer, The Biblical World, (1966). 3. George A. Barton, Archaeology and the Bible, (1933). 4. Martin Anstey, Chronology of the Old Testament, pp. 47-54, (1973). 5. John McClintock and James Strong, Cyclopaedia of Biblical, Theological and Ecclesiastical Literature, Vol. I, pp. 492-496, 603-606; Vol. III, pp. 89-102, (1870). 6. James B. Pritchard ed., Ancient Near Eastern Texts Relating to the Old Testament, (1956). 8. The New American Standard Bible, (1960).